Imagine a metropolis where, no matter where your home is, you can walk to a park in just ten minutes. And not just any park but a specially curated green space filled with playground and fitness equipment, walking trails and maybe even a soccer field or a dog park. Los Angeles County officials want to make this ideal a reality for it’s 10 million residents. The Department of Parks and Recreation set out on an ambitious mission to learn everything possible about the county’s existing parks and to lay the groundwork for improving the park to people ratio. The Parks Needs Assessment is an extensive, first of its kind examination of the existing recreational assets and park need in the County. The sixteen month long project relied heavily on community involvement. “It’s the first time the government is actually asking people what they want instead of just doing it.” said Rita Robinson, Project Director, Parks Needs Assessment, LA County Dept. of Parks & Recreation. Through neighborhood meetings, outreach efforts and simply by asking questions, officials presented residents with opportunities to give valuable input about the parks in their neighborhood. “We had health equity workshops to help people understand the connection between health and parks because we know there is a direct connection between our physical and mental health.” Robinson said. The Parks Needs Assessment shows that less than half of the county’s residents live within 1/2 mile of a park. With 51% of countywide residents living beyond 1/2 mile of a park, improving the park to people ratio is a priority. The Parks Needs Assessment also determined that Los Angeles County falls behind the national average in its assessment of park amenities. For example, Los Angeles County has only 10 basketball courts per 100,000 residents while the national average is 63 courts per 100,000 residents. Multipurpose fields and playgrounds are sorely in need in Los Angeles County. The Parks Needs Assessment shows there are only 5 multipurpose fields per 100,000 residents compared to a national average of 50 for the same number of residents. And at 15 playgrounds for every 100,000 residents, Los Angeles County falls way behind the national average of 45. Improving the county’s park-to-people ratio and improving conditions at existing parks is an expensive endeavor. For the past two decades, the county’s parks have relied on local voter approved funding from the 1992 ‘Proposition A’ which was renewed in 1996. But that money is set to run out in 2019. The Parks Needs Assessment is the county’s answer to dwindling funds. The data driven analysis lays out the groundwork for making planning and funding decisions in Los Angeles County. The assessment also provides all residents of LA County with access to parks and recreation information and opportunities. Parks are places where neighbors come together. Healthy, safe communities have thriving parks that contribute to public health and well-being, create a sense of place, increase community cohesion, improve the environment, and boost the economy. The power of a park is witnessed on any given day at the corner of 114th Street and Motion Avenue in Los Angeles. 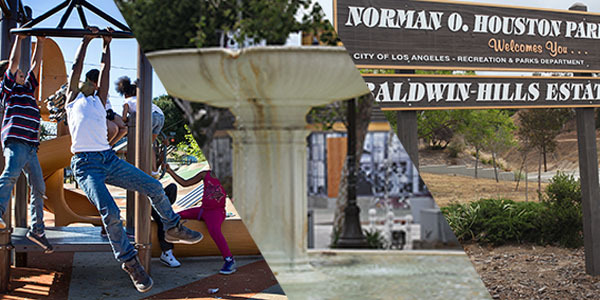 The former location of a blighted empty lot straddling the border of rival gang territory is now a safe gathering place for families and friends. Antwon led the fight to turn the empty lot into a park after learning that a developer wanted to buy the 1.3 acre of land to put up a multi-unit apartment building. Los Angeles County officials want to hear from residents about the condition of their parks. Do you have a park within a ten minute walk of your home? What is the condition of the space? Is there fitness equipment available? Is there a recreation area? Are the bathrooms safe and clean? The Parks Needs Assessment aims to help local officials, park agencies, and residents understand the future steps that need to be taken to ensure all communities have adequate access to thriving parks.